Only 450 BMW R17's were produced over a two year period. There was a supersports model R17 with 33 hp, that was only surpassed by the R68 in 1972! The R17's like many other BMWs were often found with Steib sidecars, styled similar to Zeppelin airships. There are very few R17s left worldwide. 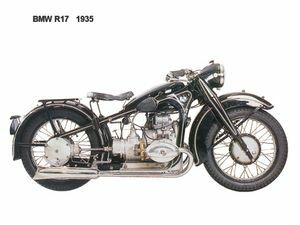 Having broken fresh ground with the launch of the pressed-steel framed R11 in 1930, BMW followed that up with the introduction of an hydraulically-damped telescopic front fork on the BM R12 and BMW R17 models, which were also notable as the first BMWs to have a four-speed gearbox. First seen at the Berlin Motor Show in February 1935, the newcomers were otherwise virtually unchanged from their R11 and R16 predecessors apart from a strengthened crankshaft. The sporting, twin-carburettor, overhead-valve R17 produced 33bhp at 5,000rpm and would be BMW's most powerful production roadster until the introduction of the BMW R68 in 1952. 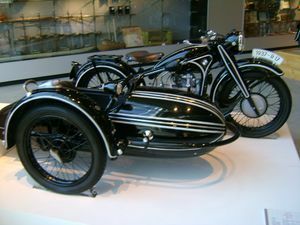 It was priced at 2,040 Reichsmarks, making the R17 the most expensive German motorcycle of its day. 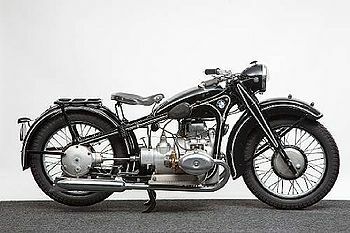 Only 436 were produced between 1935 and 1937 and today this rare and exclusive model is one of the most sought after of pre-war BMW motorcycles. This page was last edited on 20 January 2011, at 19:34.